Using Lytag coarse aggregates reduces the weight of structural concrete by around 23% compared with natural aggregate concrete. 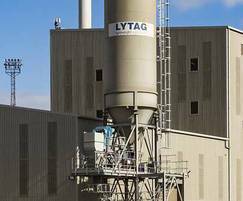 Including Lytag fine aggregate allows further weight reductions of up to 32%. It can provide the same level of structural performance as normal weight concrete so it can be used in exactly the same way. A compressive strength of up to 65N can be achieved. Placing and compaction is as easy as with normal weight concrete. Lytag concrete can be pumped long distances and to great heights, as proven by its use in numerous recent structures such as the Shard and 20 Fenchurch St (the Walkie Talkie). Finishing processes used for normal concrete can easily be applied to Lytag concrete. Meets all British & European Standards at a fraction of the weight. Including a 16% improvement on long-term deflection over normal weight concrete. Same performance as natural aggregate concrete, reduced costs, greater design flexibility.